Question on LinkedIn: What are some characteristics of a good recruiter? – A good recruiter need to be aware of the role, skills & competencies required, understand the culture of the org. and should be able to hire a candidate who matches the requirement closely . In order to be able to do this the recruiter should be skilled , possess maturity and the most important does not demonstrate superiority & ego as this impacts the candidates ability to give his/her best in the selection process. – Vibha has succinctly summed up the requirements of good recruiter.I just add one point.The recruiter should also see whether the organisation also fits the candiadte, beacuse it is important to retain talent for sufficient time in the organisation.A great candidate may feel stiffled in a cosy corner where he cannot expand himself. – Often, recruiting is looked at as being a step into the direction of HR Executive or something else on the executive level. Within some organizations, there’s very limited room for advancement which is why you find that some recruiters really aren’t good at what they do. Not because they’re lazy or don’t try, they just don’t make the dedication to excel at it. Ironically from what I’ve seen in the years that I’ve been in the industry is the ones that are the most successful, never set out to be recruiters to begin with. They were individuals that were in sales, marketing or communications and by accident found themselves in recruiting. Sourcing the right people for the right job provides for a good foundation from where important hiring decisions are made to bring people with exceptional abilities and performance into the job for the company’s success. To be a good recruiter, it takes more than just sitting in the office and waiting for applicants to send in resumes. Great talents sometimes have to be tapped from various opportunities aside from the usual. In this age of advanced technology, networking sites and online job sites do a lot to help in the recruitment process which recruiters can utilize to find the right candidates. Good recruiters also look out for potential candidates from job fairs. However, it is not enough to just recruit any candidate. Without having the right characteristic a recruiter may only get poorly-trained and under-performing employees. To be able to spot potential top talents in the corporate world, a good recruiter must possess certain characteristics: Be connected, Product knowledge, Convincing power, Be a keen observer and assessor. This is what Separates a Great Recruiter from a Good One. – As per my experience I feel Good recruiter’s characteristics are: Understanding Organization Goal/Vision and Mission, Capable of understanding the requirement (JD, Technical, Soft skills), Confidence, Showcase the career path to new hires, Vendor Management, Followups, Cordination with different depts to run the process smoothly and efficiently. 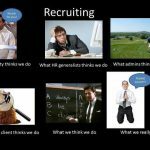 – Recruiting is a job that requires a special talent and those seeking a position as a recruiter must have a distinct type of personality. Qualities of a good recruiter are similar to those found in a good leader: displaying honesty with superiors and subordinates, having a positive attitude regardless of presented circumstance, displaying fortitude and integrity and making others a priority. Possessing these attributes will help ordinary recruitersbe extra-ordinary, rising above those who may be less enthusiastic and lack dedication to the profession. One of the most overlooked qualities of a good recruiter is having industry knowledge. This not only pertains to the administrative tasks involved with the recruiting process but also the technical knowledge required for various positions. Some of the best types of recruiters are former management professionals in a given industry.